After the shocking and cacophonous horror of battle is over -- once the smoke and dust have settled and the battlefield regains some modicum of relative calm -- nature can start picking up the pieces. For almost one hundred years, red remembrance poppies have been displayed in Commonwealth of Nations member states such as the United Kingdom, Canada, the United States, Australia, and New Zealand to commemorate fallen soldiers and service personnel. While a novel metaphor, it is a common misconception that the red color of the poppies represents the blood spilled in the brutal battles in Belgium and northern France during World War I. Instead, the red poppies symbolize the red wild flowers that were the first plants to sprout up in the disturbed soil of soldiers' graves. The practice of displaying red remembrance poppies was inspired by the World War I poem "In Flanders Fields," by Canadian physician, Lieutenant Colonel John McCrae, on May 3, 1915 after witnessing the death of a friend, and fellow soldier, the day before. The poem read, "In Flanders fields the poppies blow; Between the crosses, row on row…" Following a campaign by Moina Michael, a YWCA volunteer, to have the poppy adopted as a national symbol of remembrance, it was proclaimed as such by the National American Legion in 1920. Today, small artificial red remembrance poppies are commonly sold (for a donation) and worn for weeks leading up to Remembrance Day, which is observed on November 11 in most countries. 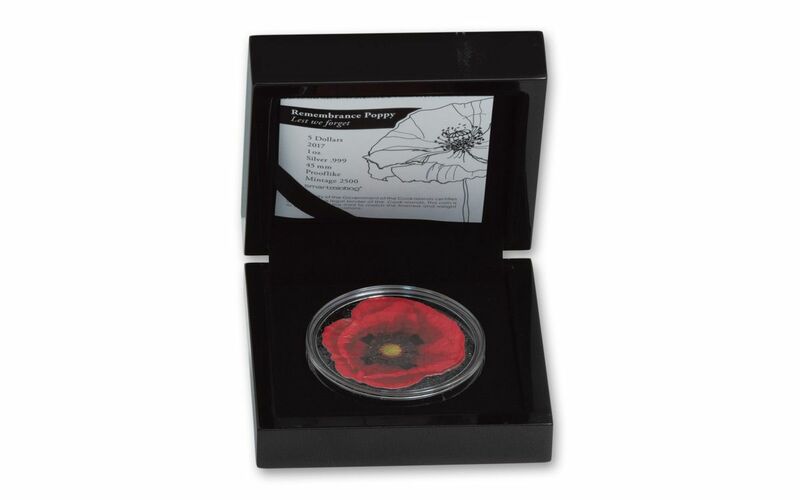 But you can commemorate the fallen soldiers and service personnel every day with this Cook Islands 2017 $5 1-oz Silver Remembrance Poppy PF-Like coin. 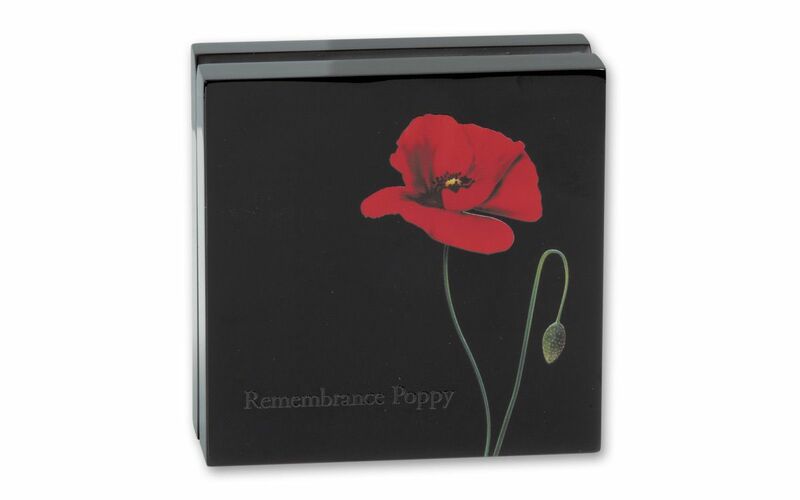 REMEMBRANCE IN BRILLIANT COLOR-- The reverse features a shaped red poppy flower. The obverse of the flower shape is uncolored and features a coin face with the portrait of Queen Elizabeth II facing right. Circling around Her Majesty are the inscriptions "ELIZABETH II," "5 DOLLARS," "COOK ISLANDS," and "2017." The inscription "LEST WE FORGET" appears on the bottom right of the poppy-shaped obverse. PURITY AND SMARTS-- Using a full ounce of 99.9% pure silver, this coin was struck with smartminting© technology, a revolutionary technique in the field of modern numismatics. 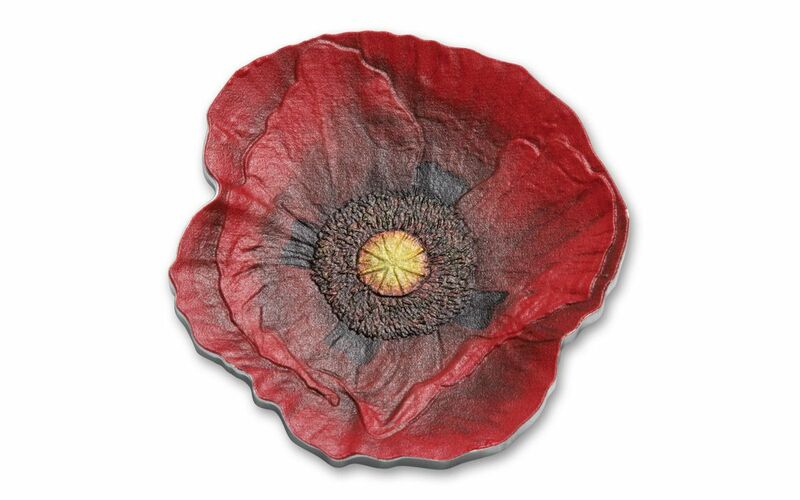 The smartminting© technology allows for unparalleled relief heights and intricate details without the need for more raw materials, and it can be applied to antique, proof, or colored coins like this brilliant red poppy proof-like. COOK ISLANDS LEGAL TENDER-- Each 2017 Silver Remembrance Poppy is $5 Cook Islands legal tender, a fact reflected on the obverse along with a profile portrait of Queen Elizabeth II. ELEGANTLY DISPLAYED-- Each coin is certified to be in proof-like condition and will arrive housed in a tasteful glossy black display case paired with its certificate of authenticity. 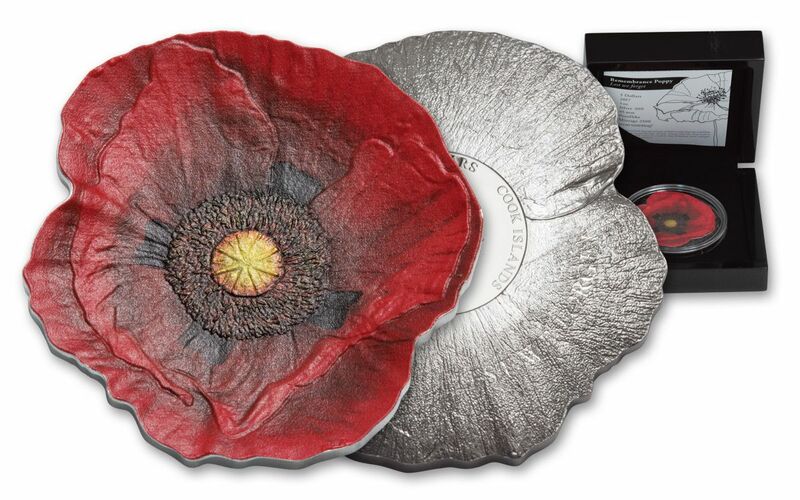 VERY LOW MINTAGEM -- While decorative red poppies are widely available around Remembrance Day, only 2,500 of these stunning 2017 $5 1-oz Silver Remembrance Poppy PF-like coins were minted worldwide. Displaying a remembrance poppy has been an colorful way to honor fallen soldiers and service personnel for almost one hundred years. 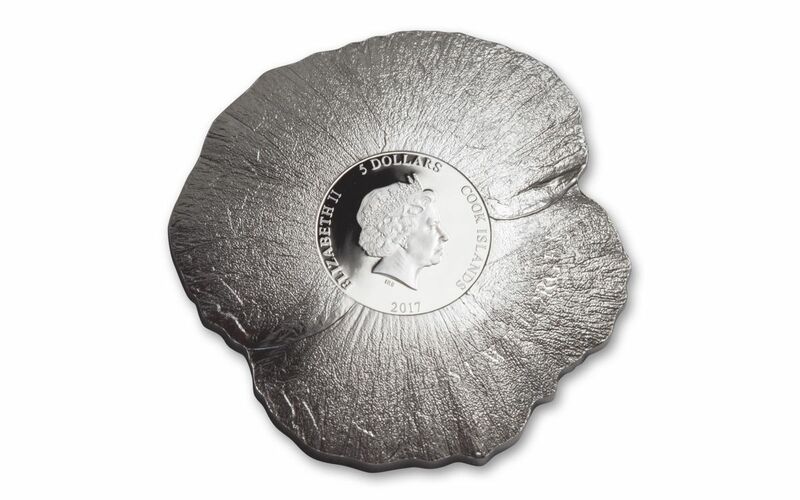 While poppies made of silk, metal, and plastic are widely available all year in countries that observe the holiday, this Cook Islands 2017 $5 1-oz Silver Remembrance Poppy PF-Like coin is only available for a limited time (until we run out)!